Phoenix Broodmare Farm is located in the northeast of Victoria, and is a premium Thoroughbred farm that specialises in all areas of equine care and management. Only ten kilometres from Euroa, Phoenix Broodmare Farm is owner-operated by Damian Gleeson and Deb Gifford. The farm caters to Victorian and interstate breeders who wish to utilise Victorian stallions during the breeding season, and offers permanent or seasonal agistment as required by clients. As the name suggests, Phoenix Broodmare Farm is broodmare focused, and has all the required facilities to provide full care to every broodmare and her offspring. Constructed with the health and safety of broodmares and her foals as the prime objective for the farm, Phoenix Broodmare Farm has modern, safe fencing, with all paddocks designed to enable practical and easy movement of horses in a stress free environment. The stable block is also designed with broodmares at the core of the business, with double sized boxes for mares with newborn foals, as well as purpose built foal handling yards to aid in their general development. Every stable is well ventilated. Pastures at Phoenix Broodmare Farm are maintained without herbicides or insecticides, and the pasture management program takes advantage of the high rainfall in this locality. Phoenix Broodmare Farm is close to the Strathbogie Ranges, and aims to be an environmentally friendly farm that works with the land to produce the best growing conditions for young racehorses. It takes a team effort to grow a sound racehorse, and Phoenix Broodmare Farm calls on a range of experts to create this team. 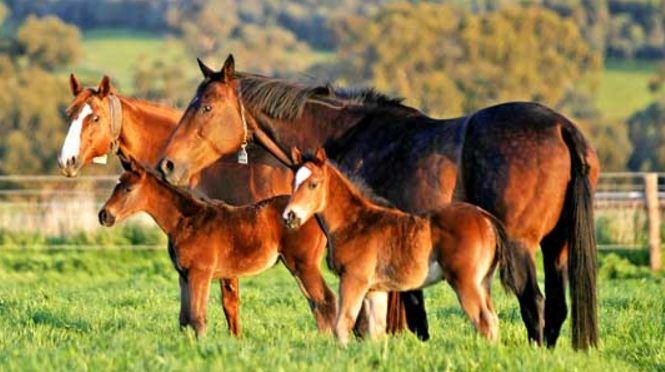 Goulburn Valley Equine Clinic with reproductive expert Dr Angus McKinnon provides veterinary services, with the added benefit that Dr McKinnon lives nearby Phoenix Broodmare Farm and attends the farm daily during the breeding season. There is also full access to professional farriers, dentist, chiropractor and transport services. For a broodmare owner wanting a complete agistment service for their precious broodmare investments, Phoenix Broodmare Farm is a brilliant option.